East meets West: Dairy Queen! Year by year as I continue to live in Taipei, I see it changing from a traditional Chinese culture to a western culture. As the more western pockets that i see pop up the harder it is for me to leave. Everyone living abroad will eventually start to miss the comforts of home. So, Taipei, in another effort to keep me in Asia has imported the Dairy Queen brand. And not just the products, but it's very own store. Right in my own backyard in Tianmu! Located a stone's throw north of Tianmu square on zhongshan north road section 7. The Dairy Queen wasn't even this conveniently close when I lived in California. Walking in, they have the same decor and the same menu. Although it is a trimmed menu. They are unfortunately missing the hot foods and the eclectic toppings bar. But they do have the two main Dairy Queen staples, which are the chocolate dipped soft serve and the Blizzards. The Blizzards have over 15 taste selections. In addition, they have the DQ smoothies, DQ ice cream cakes, Dilly bars and Moolattes. I love taipei! Bring more. Bring In-and-Out, Bring Five Guys Burgers, Bring Target! Why move home, home will come to me. Time for a Blizzard, see you next post. There's nothing like the comforts of home. So as a friend and I roam around the global mall for a quick bite, my periphery sees a sign that says CLAM CHOWDER. We stop and walk over to Bakery 49. Bakery 49 turns out to be a quaint restaurant specializing in northern and southern California cuisine. It was started by a group of friends that have relocated from San Francisco. Walking in, the atmosphere reminds me of Napa valley. A row of wine fridges line the back framed by a brown and white stone hearth. Because the restaurant is located in what global mall calls the outdoor seating restaurants, it has both indoor and outdoor seating as well. However the indoor seating is the one with the view. Continuing to the food. I only tried the clam chowder. 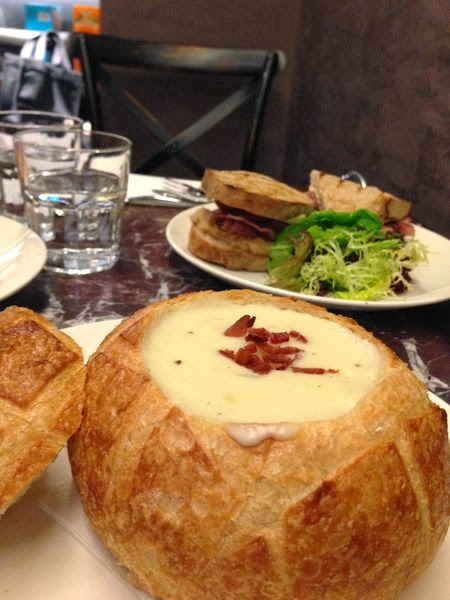 It's reasonable priced at $150NT, +$30NT for the sourdough bread bowl. The clam chowder was nice. I tasted house made and creamy with bits of bacon on top. I forget which disappointing restaurant I went to before that had clam chowder, but I was pretty sure it was straight from a Campbell's can. Bakery 49's clam chowder is so far the best clam chowder i've had to resembles what you get at Fisherman's Warf. I do wish it was a bit creamier and more chunky. It did have a few good sized calms in there, but no potatoes were added. I would have paid a little more for a larger size too. I guess they do still have to localize it. It's definitely a smaller size compared to a real SF bread bowl. Some of the other things I noticed on the menu: chicken and waffles, kobe burger, pastrami reuben sandwich, shepard's pie, fried calamari and Cioppino. They also have a pretty nice assortment of California wine from the likes of Duckhorn and Stag's Leap. Looking on their website, they have two other locations in Dunhua and Mistukoshi A8 near the 101. Their other two locations seem to be larger too. One with a full sized bakery and wine bar. Check them out at www.bakery49.com. I will be returning to my SF away from SF. Finally, the holy grail of beerdom has arrived in Taipei! The Beer & Cheese Social! Taiwan is full of bars and beer pubs that only carry belgian beer. Where belgian beer is great, it need more variety from other countries that can make great beer. What about America, Germany and the rest of Europe? Thanks to Beer & Cheese Social, they have imported beer from the likes of Anchor Steam, Elysian, Rogue, Mikkeller, Brewdog and Maisels Weisse. See the photo of the beer list for more. Outside of straight beer, they also delve into hard ciders, beer cocktails, frozen cocktails, some spirits, shots and even some house wine (red and white). And what really put a smile on my face...growlers! They'll be offering growlers soon. $220 a pint, I may never need to drink Taiwan beer for a cheap throw back again. The B&C Social is located conveniently on the east side of Daan park. So take the MRT and exit from Daan Park MRT station and walk. You know your at the right place, when you walk into a small bar with humongous letters spelling out BEER above the bar. The decor has a very industrial bolts and rivets look. The chairs have a rusty beat-up look with a nice patina growing on it. The walls, ceilings and crossbeams were painted in chalkboard black. Obviously for a reason. All around the place, scribbled in chalk were the daily specials, flights and special deals. There was probably more written, but I didn't get a chance to read everything. There's a loft above for overflow on the weekends and reservations for parties. Getting on to the food, I ordered a jalapeño grilled cheese sandwich and a spicy beer pretzel. As the menu puts it, a classic American Tillimook extra sharp cheddar grilled cheese sandwich between two pieces of fresh baked rustic herb bread smothered with Jalapeños and a dill pickle on the side. The pretzel was good, but what makes it special is the jalapeño cheese dip that it comes with. It's the same melted Tillimook cheese and jalapeño spread used in the sandwich. It worked well with the baked rosemary pretzel. They also offer daily special and beer flight paired with cheese. So they DO have cheese. That's one this I was disappointed with. I was hoping for cheese as an independent selection on the menu. I'm as much of a fan of cheese as I am beer. I got to also meet the owner (or partner) and beer crafter, Shaun. This tall, bearded and heavy sat man in appearance, is a Canadian ex-pat that moved here 9 years ago. He has a degree in brewing and distilling and has been in the industry for years. He first started out in Taichung and other smaller cities near Taipei. But he feels Taipei has a better, livelier environment for his beer social. He plans for B&C social to brew their own house branded beer. However there are some difficulties with local laws. Shaun informed me that Taiwan beer has a monopoly in Taipei. No other company is allowed to brew beer within the Taipei city limits. He's currently looking for a place outside of Taipei to brew his own house beer, which I eagerly look forward to. So until he gets that sorted out, we'll stick to the awesome american and european selections he already has at the social. Don't forget to show the waitress that you checked-in on Facebook for a free shot glass of a frozen margharita. Some say your not officially inducted into the Taiwanese life until you've tried sticky tofu and gotten into a scooter accident. Well if you've been reading, the stinky tofu was checked off quite some time ago. But since I don't dare own or drive a scooter in Taiwan, I haven't experienced any vehicular accidents. However I've just entered Taiwandom. Although I was only riding my bike, I was hit by a scooter. It was at an intersection to a small street. NO stop signs, NO traffic lights. Your typical Taiwanese free-for-all intersection. So I can't say anyone was particularly at fault here. However I kind of do feel bad for the guy. His scooter was badly broken. My cheap $1300 NT bicycle is now significantly less functional than before. And the poor guys mirror and dashboard was busted. His steering arm was definitely tweeked. When we went our separate ways, he scooter was dead in the water. The engine wouldn't turn over. Bodily, he was OK since he had protection. And miraculously, I'm fine. No scratches, no bruises, no blood. Well, I have some ravioli cooking in the kitchen, so...Dinner time! Happy October everyone! Look what I found on my Costco trip yesterday. Scones! I love eating these delectable English quick breads for breakfast. I happen to have some jam and awesome tea I brought back from Seattle. So Cheers! to an awesome Wednesday morning breakfast. If you've been reading my blog, you know I'm always on the search for western treats wherever I can find them. I'm just finishing my first one right now. Although not the best scone I've had in Taiwan, but it's a cheap. I think I picked it up the pack of 6 for $130 NT at the Neihu Costco. And in the spirit of Halloween, my scone looks positively ghoulish with it's mouth wide open and gleaming raisin eyes. Next week is the TAS food fair, so I hope I'll have time to make it out and post what delicious food awaits. The time of 中秋節 (zhong qiu jie) is upon us. It is otherwise known as mid-autumn festival or moon festival. 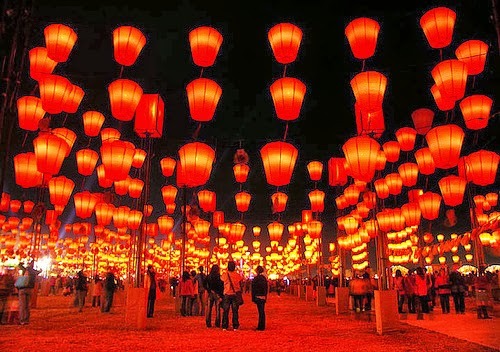 In Taiwan, a notable part of celebrating the holiday is the carrying of brightly lit lanterns and hanging them outside of buildings. Some even light and set off sky lanterns. Additionally, as with many Chinese holidays, family and friends gather in celebration. It's a hallmark tradition to exchange moon cakes between family members and friends. In Chinese culture, a round shape symbolizes completeness and unity. Finally, my favorite activity is to join with friends and BBQ on a rooftop over-looking Taipei. Have an awesome 中秋節 everyone! Sunday was a nice day out on the town with a good friend visiting in from Taoyuan. It was yet another scorching hot day in Taipei. But we continued to survive the heat at Huashan 1914 creative park. Fortunately we were there for the Star Trek exhibition. A 3 month event showcasing some of the legendary show's set props and concept art. I went to another Star Trek exhibition in Seattle years ago and was amazed and spoiled by it. So sorry to say, but the Taipei event was quite mild. Majority of the displays were set costumes and various USS enterprise models. However it was interesting to discuss the quality of the set costumes with my friend, who majored in textiles. While we were talking food over some coffee at VVG thinking. What ended up was a sudden craving for steamed mussels. So we headed over to the local Carrefore for supplies. Your basic recipe calls for mussels, butter, garlic, white wine and more butter and garlic. Add a bay leaf, some herbs and steam...done! Julia Child's Moules a la Mariniere. Add some french bread, aged balsamic, Beecher's smoked flagship cheese and finish that bottle of white. Bon appetit! Over the past weekend I had the privilege of a three day weekend, so I took full advantage of it and headed out of town to Kenting. 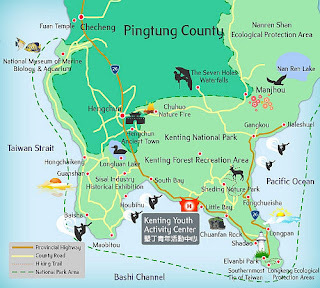 If your an ex-pat living in Taiwan and you don't already know of Kenting...where have you been? For those planing on living in Taiwan..put Kenting on your to do list. As a fellow Californian, it's a taste of home. I'm talking about beaches, clubs, night markets, BBQ, water sports, awesome food and tons of other activities. 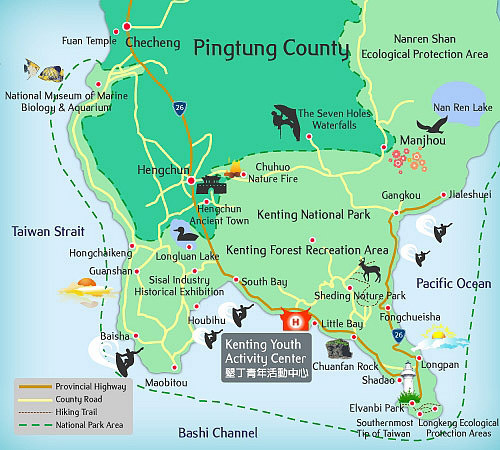 Before going into detail about this list, let talk about getting to Kenting. Transportation unfortunately isn't as convenient, but still as convenient as Taiwan could make it. From any major city in Taiwan, you can take the High Speed Railway to Zuoying station aka Kaohsiung. From the Zuoying station, there is a express shuttle bus that departs every 30 minutes to Kenting. If I remember correctly, ticket prices were around $350 NT one-way and $650 round trip. It's an open ticket, so there's no assigned time. It's a 2.5 hour ride into Kenting. OK so now lets go down that list. Beaches. There's only a handful but they vary in size and quality and popularity. My favorites were Baishawan (白沙灣), xiaowan (小灣), dawan (大灣) and Jialeshui (佳樂水) which I didn't get a chance to visit. I heard Jialeshui is the one to go to for surfing. Xiaowan and Dawan however are easy ones to visit on since they are just off the Kenting road main strip. Baishawan is a higher quality whiter sand beach that is less crowded however is further west near Maopi and requires figuring out your own mode of transportation. If your looking for a hotel on the beach, the only one is The Chateau. It's right on Dawan, which is one of the longest beaches. However the sand is a little dirty and the waters are littered with churned up seaweed bits. Adidtionally, If you want to travel a few kilometers north, there's Nanwan (南灣) which is an awesome but crowded beach. They have many water sport businesses that sell rides on a jet-ski or water tubes (of varying size and shape). When I was there I picked a set package of three (三合一) for $700 NT. Also, there's plenty of small restaurants, cafes and board rentals along the street across from the boardwalk. Clubs. You can't miss them along the Kenting main strip. The night market and the clubs start getting wild as soon as the sun starts to set. There's even a large and quite famous transvestite club. I haven't felt adventurous enough to go in, but perhaps some else would be willing to report back. As for food, the popular dish around the Kenting area seems to be Thai food, seafood and light meals like sandwiches and pasta. But all if not most restaurants have a nice surf shack feel to them, that really lends itself to the laid back atmosphere of Kenting. It's like no other place on the Taiwan island. If you want a outdoor tiki torch BBQ with a pit roasted pig, then steer your nose to the Ceasar Hotel before sunset and grab a table by the street. Prices are about $1000/person, all you can eat and beer is extra. 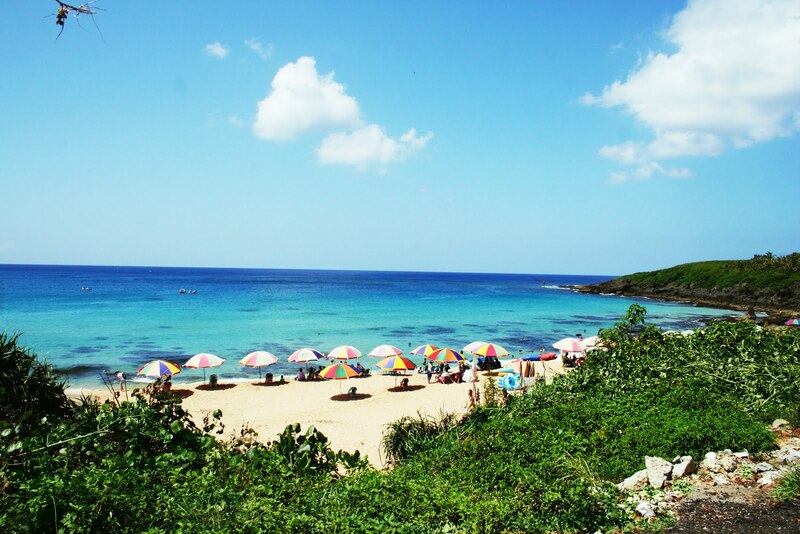 There are plenty of things to do outside of Kenting too. Unfortunately, they are some distance away. It's better to charter a taxi for 8 hours at $3000 NT or rent a scooter for $1000 NT a day (International driver's license required). You can watch the sun set from Eluanbi lighthouse, visit the National Museum of Marine Biology and Aquarium, soak in the Sichongxi hot springs (四重溪溫泉), hike in the Kenting Forest National Park or the Sheding Natural Area, go snorkeling, scuba diving or go-karting. There's so much more to write about, but i'll stop for now. I'll definitely be making a return visit and exploring some more. The requirements for getting a cellphone plan in Taiwan have changed since I came here. You can either sign up for a 2-year plan or sign up for a 7-11 pay-as-you-go sim card. Both should be no problem for foreigners to get while here. It requires your passport, an international driver's license, an address for the application and a $3000 NTD (approximate) deposit. Depending on what carrier you choose, some additional requirements may be required. For example, a health report, an alien residency card or a work permit. Gone is the requirement for a citizen’s endorsement! You can sign up for a 2-year contract at any local cellphone company and they'll provide discounted cellphones. The biggest being Taiwan Mobile (台灣大哥大）and FarEastone. Or you can sign up for a pay-as-you-go sim card at 7-11 and use your own unlocked cellphone.